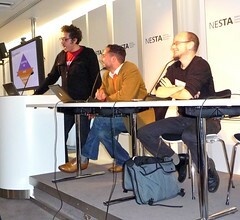 It was my pleasure to attend the – hopefully inaugural – Open Hardware Conference at NESTA in Plough Place in London. The event was jointly organised by NESTA, Open Business and 40 Fires, the foundation behind the Open Source car, Riversimple. Christian Alhert of Minibar fame was MC for the day. Roland Harwood of NESTA did a quick introduction/greeting. The theme of the day was how to open up hardware to enable people to work together. The day’s first presentation and discussion featured Daniel Soltis, seen to the right of the photo on the left, who is an Interaction Designer at Tinker.it, and Francesco D’Orazio of Face, seen at the lectern. Tinker.it, you may well know, are the company which sell the Arduino chips. Face is a new company which seeks to apply the techniques of crowd-sourcing and social media to advertising campaigns. Daniel gave an overview of Arduino’s progress so far since its arrival in 2005. It was Open Sourced because the department at the University where it was developed was due to close, and Massimo Banzi and his team wanted it to live on after the department had gone. It was deliberately given a low price in order to keep it within the finances of the average engineering student – it would cost no more than going out for dinner and a few beers. (Obviously, that was in Italy – if it had been the UK, it would have cost 8 pints and a takeaway curry). They have sold 60,000 Arduinos to date. The name ‘Arduino’ is trademarked, the schematics and CAD are released under a Creative Commons Attribution license. The companies using Arduino tend to be Open Source based. Francesco talked about Face’s co-creative model of collaboration with companies to do research and innovation. After some experimentation, they found a mix of offline and online activities work best, with a group of 25-30 people gathering to work on ideas. 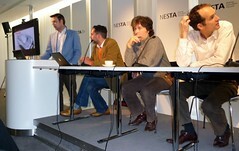 A lively panel discussion followed, where Francesco got a bit of (unfair to my mind) stick for his company’s activities. As Francesco said, the companies they work with are traditionally very closed, and any success Face has in opening them up is a real achievement. He had identified four key motives for participation in the offline activities – money, love, glory, fun. There was a response that once money was included the rest of the motives fell to the wayside. Daniel said the driving force behind the take up of the Arduino was an obsessive need to tinker with things. Paul Downey from Osmosoft was concerned that Freedom was a word a that hadn’t been used in the discussion. Someone commented that one of the the beauties of Open Source was opening up and watching where it goes. My own thoughts are that these are both very new business models which will continue to develop, to be honed, to be built upon. Any discussion of their merits as yet is premature, as they are still in spin. it’s still fun to discuss them, but the bottle hasn’t stopped spinning yet. But there won’t just be one way to do it, we will see a myriad of approaches creating interesting and successful things. The breaks and lunch at Open Hardware Conference were busy with excited chat, people swapping ideas, business cards, everyone was open and ready to exchange ideas. It was impossible to stand on your own: someone would approach you to chat, someone would bring you into the conversation. It was heartening to see and exhilarating to be a part of. After the first break, it was all Open Source cars. Patrick Andrews and Hugo Spowers from 40 Fires, (pictured on the right) and Jacco Lammers from c,mm,n (at the lecturn) gave a discussion of their respective projects. 40 Fires is a foundation which oversees the development of the Riversimple Open Source car. C,mm,n is an Open Source car development from the Netherlands. Both had identified Open Source for pragmatic, as well as ideological reasons – they thought opening development up to the world would result in a better product, quicker to market. One of the points that came out was the Arduino is a learning tool used to build prototypes, objects which are not mission critical – cars, Open Source or not, have to work. There are less opportunities for a hydrogen car to break down than, say, a petrol driven car – there are less moving parts which potentially could go wrong, but still the car has to be reliable. 40 Fires do not intend to sell cars – what they will do is lease them, which they think will cut down on the perpetual upgrade cycle car owners can find themselves on, to “establish a business model that rewards longevity and low running costs rather than obsolescence and high running costs”. After lunch the delegates had a choice of two discussions, one continuing with Open Source cars, the other I didn’t quite catch. I was interested to hear more about Open Source cars. The session switched between ‘the regulatory bodies governing production cars are too daunting to make this project realistic’ to ‘it’ll be alright’. 40 Fires picked up some useful feedback – no one expects an Open Source project to be a self-governing utopia. It’s OK to be the benign dictator, to make decisions as you see fit, to run proceedings. Contributors want guidance, they want to be useful. Give them a specific problem to solve. Hugo and Patrick started off in motor racing. The Arduino came out of Academia. Someone (I think it was Jacco) mentioned some particular hardware had been developed by some country’s military. Motor racing, military, academia – these are three areas that scratch their own itch. They have funding models which allow them to develop projects purely for their own benefit, which means they don’t have to second guess the requirements of the market – they are their market. But any competitive advantage is short-lived – their competitors will catch up, will reverse engineer and find a way to get back on equal footing. So innovation needs to be constant, because the knowledge will soon be assimilated by others. The ‘Open100’ competition is a celebration of the power of openness and mass collaboration. You can be part of the competition by nominating the company you think is the best open innovator. The competition will be open until 12th February while the winners will be announced on 24th February, with the help of Our Judges. The winners are those who will be included in the list of the world’s top 100 open companies. Before the final session, I got to say my piece about Make. Finally we had a talk from Andrew Katz, the lawyer for 40Fires, who talked about open source licensing, the benefits and downsides of the GPL. A hearty contingent convened at the Public House to continue the discussion, even through the rain. This was a thoroughly enjoyable, thought provoking day. The delegates drifted home at the end of the night knowing they’d been involved in something that matters.